Elizabeth studied at Parsons School of Design, graduating with a bfa in fashion design. Immediately after graduation, Elizabeth gained recognition in the industry, quickly rising to very senior roles at several prestigious fashion houses. She designed for some of the most recognized and esteemed fashion designers in New York City, including Donna Karan, J. Mendel, Max Mara, and Isaac Mizrahi Couture. At age 22, she became the head designer of Isaac Mizrahi, where she designed both the runway collections and custom couture for clients all over the world. Similarly, at Donna Karan, where she played an integral part in the launch of Donna Karan Atelier, Elizabeth was responsible for creating one-of-a-kind gowns and dresses for the red carpet. After honing her skills for nearly a decade, Elizabeth launched her own namesake, sold exclusively at Bergdorf Goodman in New York City. 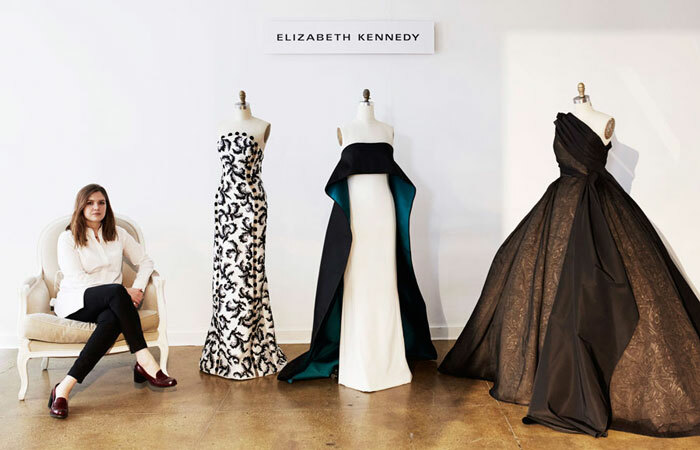 Elizabeth Kennedy epitomizes luxury in the pure sense of the art form. In the first two years, the collection has already found tremendous success at retail and in the realm of custom couture, with recent clients including Molly Sims, Mariah Carey, and Sharon Osbourne. It has been embraced as a collection that has design invention, modernity, and integrity. Elizabeth is regarded as one of the most skilled talents of her generation, and credits her success to the many years of experience working as a leader in the fashion industry. The collection is hand-crafted and produced in the New York City garment district, an effort to support high-end fashion manufacturing in the us. Copyright © 2018 Elizabeth Kennedy. All rights reserved.